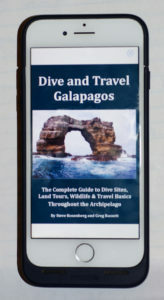 In basic terms, Dive Travel Guide eBooks are digital versions of print guidebooks. Our eBooks are perfect for researching a destination, planning your trip and giving you information while you are on your dive vacation. Virtually everyone travels with some sort of electronic device these days. Our eBooks contain an extraordinary amount of content; more than most traditional guidebooks. Once you download one of our eBooks you don’t need to have an Internet connection to access all of the information in the eBook. You can access nearly all of the features of the guide without an internet connection, including the electronic Table of Contents, the digital search tools, the ability to enlarge images to full screen and watch embedded video. In addition, you have the capability of adding your own notes to the text in effect making our guidebooks terrific dive/trip logs. You can enlarge the high-resolution images and embedded video to the full size of the screen on your smart phone, tablet or laptop by just double tapping on the screen. When you do have an Internet connection, the eBook gives you the ability to utilize social media for sharing your comments with others and to use live links contained in the book for accessing additional information. The eBooks are a lot less expensive than regular print books and offer so much more. Our eBooks are available from iTunes, Google and Amazon. Finally, in consecutive years, our guides have received prestigious awards in the international Media competition sponsored by the North American Travel Journalists Association. Most recently our guide, Dive and Travel Galapagos, was named the top Travel Guide published in 2017. Download one of our award winning guides today and let us know what you think.